Thanksgiving may be the most American holiday of all: It involves eating obscene amounts of food, yelling at your family (usually your in-laws), and watching hours of football on TV. While that may seem like an average day for an American, Thanksgiving is actually unique. It falls on the last Thursday of November (11/24 in 2016) every year, and has its roots in the origin of the country. The first American settlers arrived in New England – the northeastern region of the United States. The Puritans, were not familiar with the land and climate they now lived in. ThePuritans were very good at being religious and pious, but their first attempts to harvest fruits and vegetables were not great. Luckily, the indigenous people in the region, sometimes called Indians because Americans are excellent at geography, were pretty good with the land. In an act of generosity, the native people helped the Puritans survive their first seasons in America by sharing their food and knowledge. In return, The Americans repaid the native peoples with guns and blankets, which contained cool European diseases like cholera and smallpox. Americans like to commemorate this glorious cultural exchange by ‘giving thanks’ each November, despite the sad fate of the indigenous people of America. 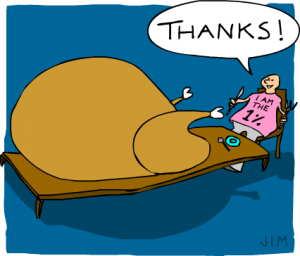 Typical Thanksgiving food includes: pumpkins, yams (sweet potatoes), cranberries and of course an enormous turkey. Scientists recently discovered that Turkey contains a chemical called tryptophan, which causes sleepiness, which explains some, but not all of the napping that Americans do on Thanksgiving day. Thanksgiving meals famously include leftovers for the days or weeks after the meal, so you may be eating Turkey for a while. Most importantly,the president of the United States, officially pardons a live turkey every year in a televised ceremony, meaning that he or she will not be eaten this year, unlike tens of thousands of his bros. Congratulations, Turkey.